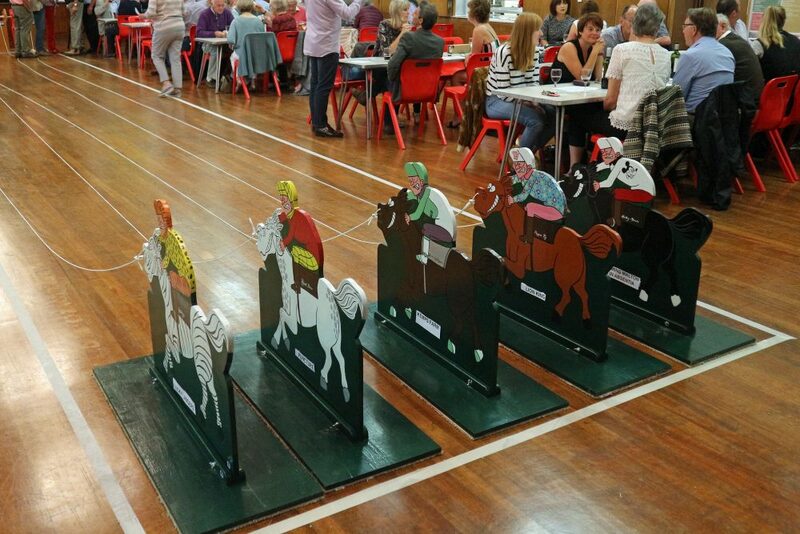 Malton, Norton & District Lions Club ran its inaugural Horse Racing Night at Malton School on the evening of Friday 31st August, with all proceeds going to Ryedale Special Families (RSF). 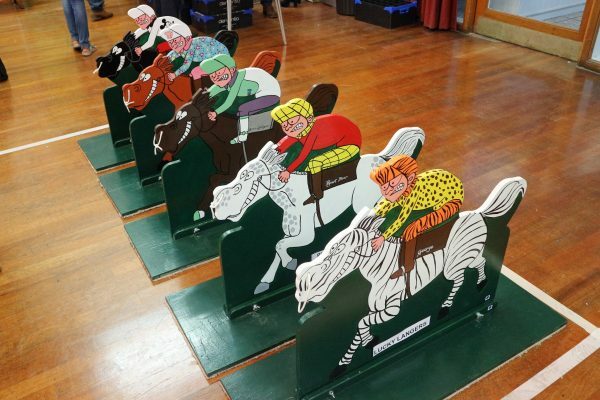 The horses beautifully painted by Sue Maud and winding stations courtesy of Norton Joinery were worked hard by the jockeys over nine races including a ladies race! Pies and peas were on hand after the third race and a great time was had by all. 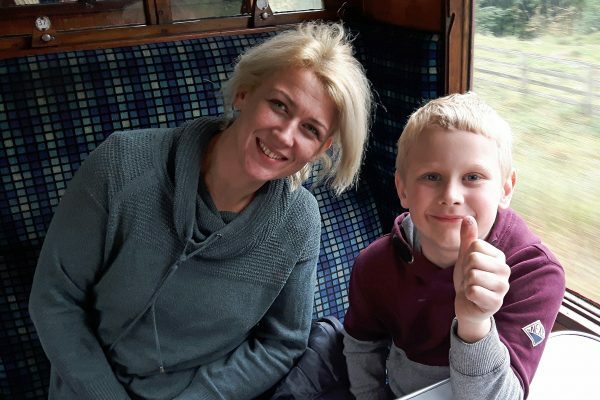 Lisa Keenan who leads at RSF spoke to the race goers and explained she was confident the Lions event would raise enough money to get them past their target of £100,000 for a deposit to buy their own premises. 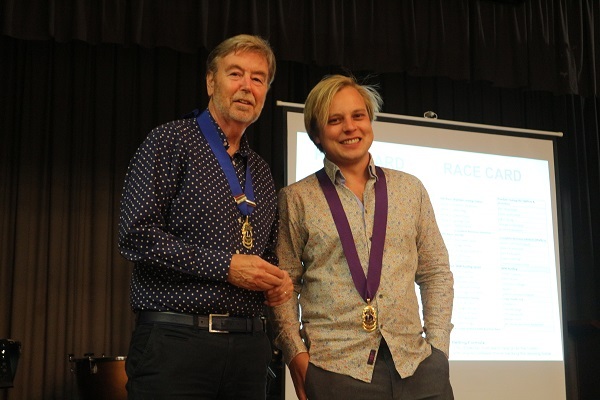 Lions President Steve and Vice President Jack were Clerks of the Course, Nick Simpson was MC for the evening and Clan Lindenberg were in charge of the starting stalls! 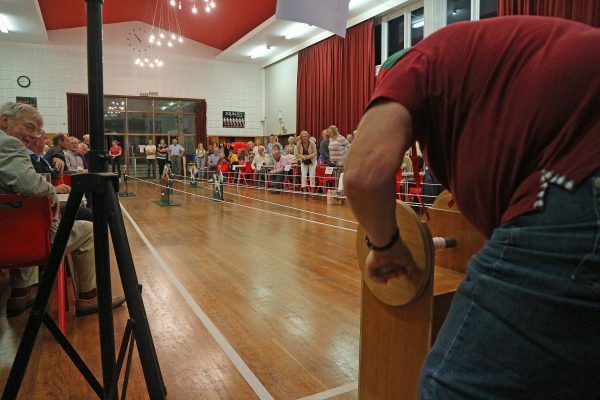 If you’d like to use the equipment for your own race evening – message us on FB. 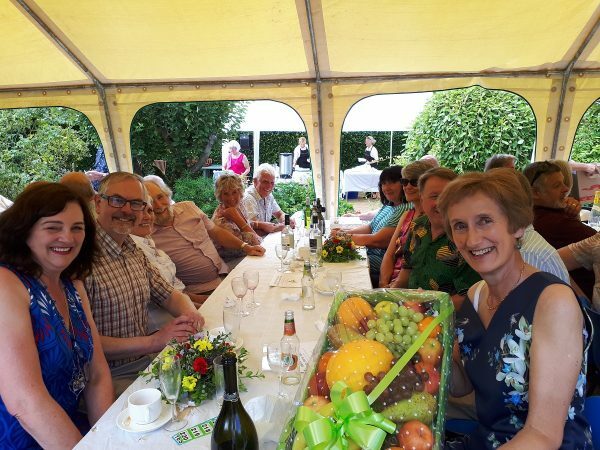 Sunday 22nd July was the Lions Summer Lunch at Settrington when over 100 Lions and guests enjoyed a wonderful Hog Roast prepared by Fryton Catering. 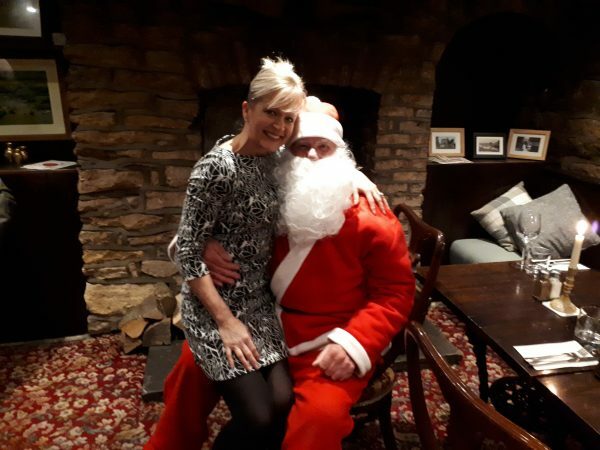 The weather contributed to a very successful fund-raiser for the Yorkshire Air Ambulance at the start of President Steve’s year. 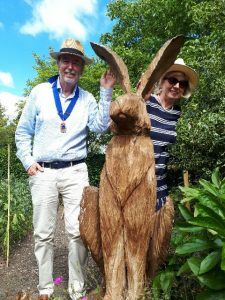 President Steve and Anne encountered some interesting wildlife in the garden of John and Sue Harrison who hosted the lunch! 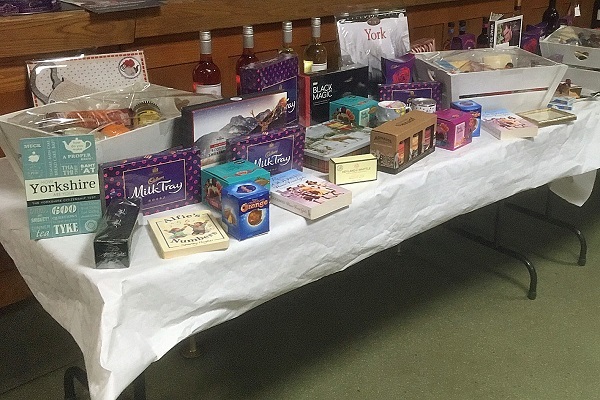 The raffle was very well supported and Steve had a few words of thanks for all who attended. 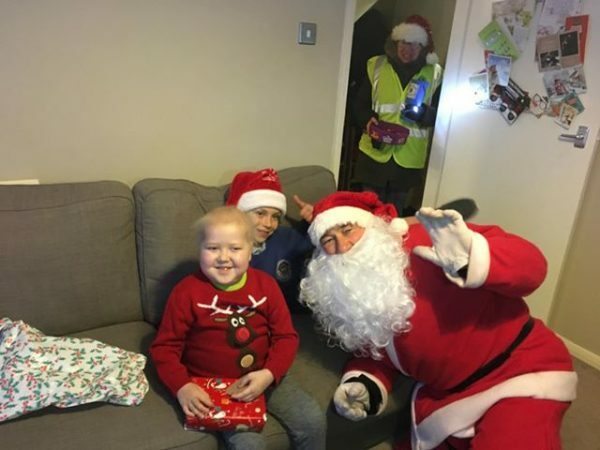 When all costs are taken into account the event raised just short of £2,000 and this was made up to a £3,000 donation from our club funds. 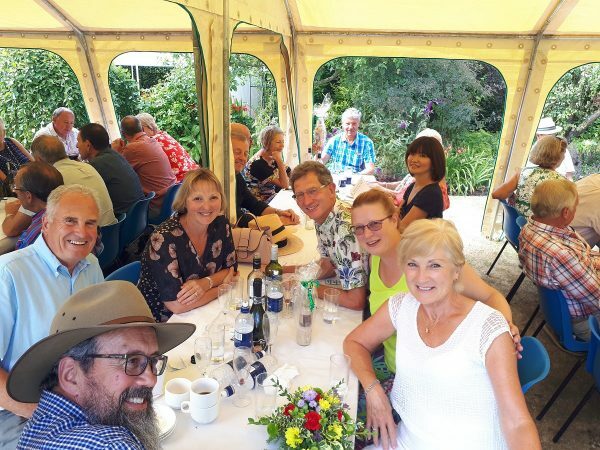 Thank you to John and Sue Harrison for hosting the event, to all those who helped set up and take down the marquees and to everyone who attended and supported us. Lions bite off more than they can chew? NEVER! Okay – so perhaps the task was a little larger than we thought (and the river in the background a little higher)! 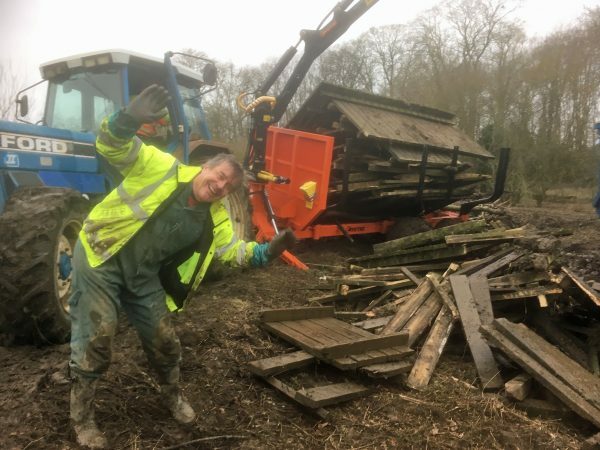 When Fiona Croft approached Malton Lions for help removing a pile of wood which had been a boardwalk, we weren’t quite sure what we were letting ourselves in for. The boardwalk in Lady Spring Wood, ran by the River Derwent between Norton & Malton and Old Malton. 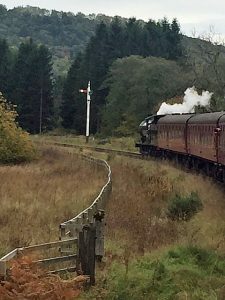 It was unsafe, unlikely to survive another winter as it was in disrepair, and had to be removed. A small bridge over The Cut nearby has been removed for the same reason and together these limited the routes that can be taken by walkers. 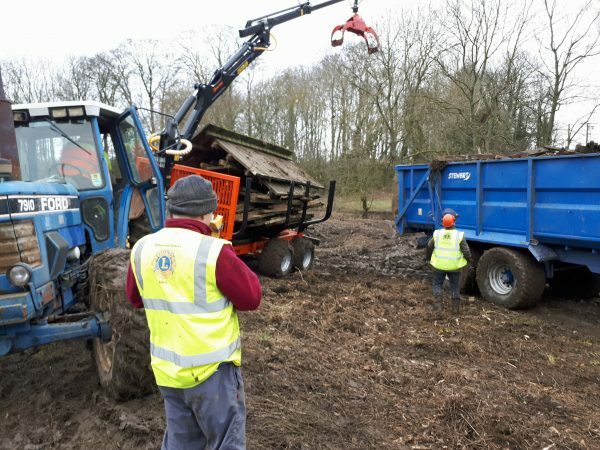 Using a tractor towed wood trailer and crane plus “Lion-Power” to move the smaller pieces of wood the first trailer load is three quarters full. 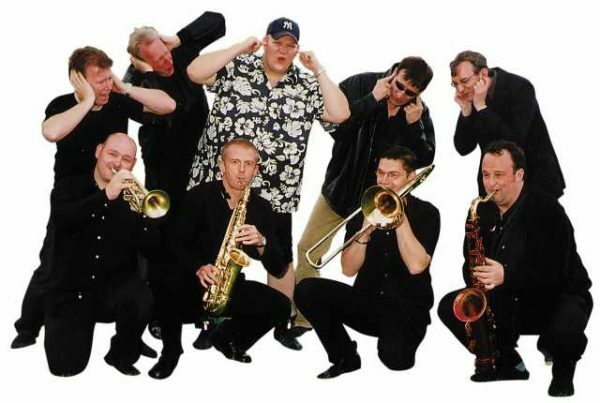 l to r Lions Russ Grimshaw, Steve Sidaway, Mark Harrison, Jack Wilford and Nick Simpson. 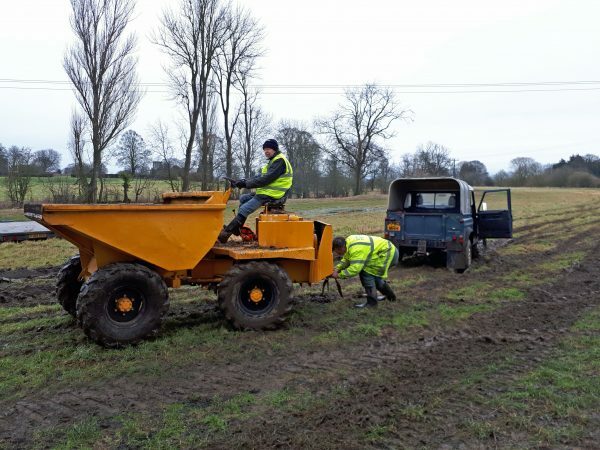 Lion Mark Harrison joined Fiona on site to assess the problem and decided that through his business – Ryetec – he had the equipment required to do the job in the exceptionally boggy conditions alongside the River Derwent which was very high after the recent rain. 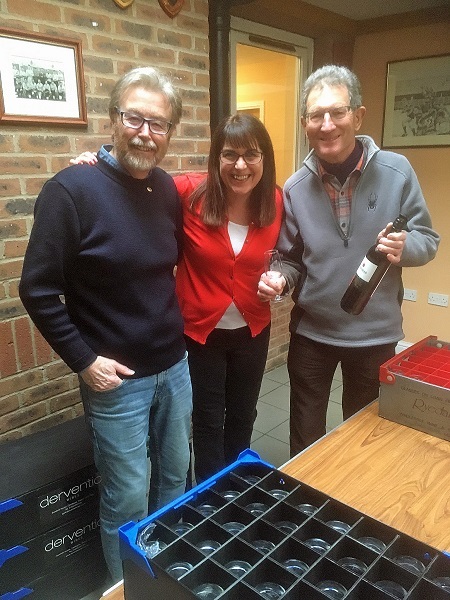 All that was needed was a group of “willing” volunteers from within the Club. In Fiona’s words this is what happened next. THANK YOU LIONS, YOU ARE THE BEST! 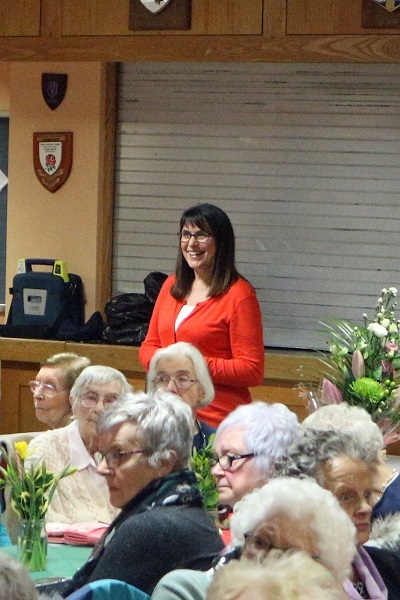 Malton & Norton Lions Club have worked miracles for the Lady Spring Wood project today. 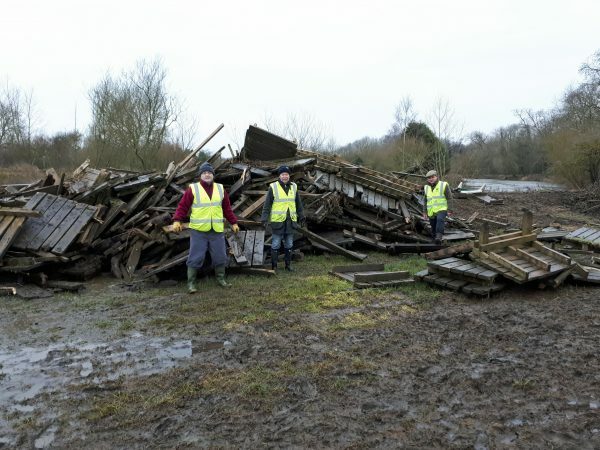 Mark, Steve, Russ, Nick, Richard and Jack appeared at 8am with huge tractors, trailers, cranes, dumpers, and utter determination to get the enormous pile of boardwalk wood out of the water-sodden field by the wood, and to the Gannock car park opposite The Royal Oak. 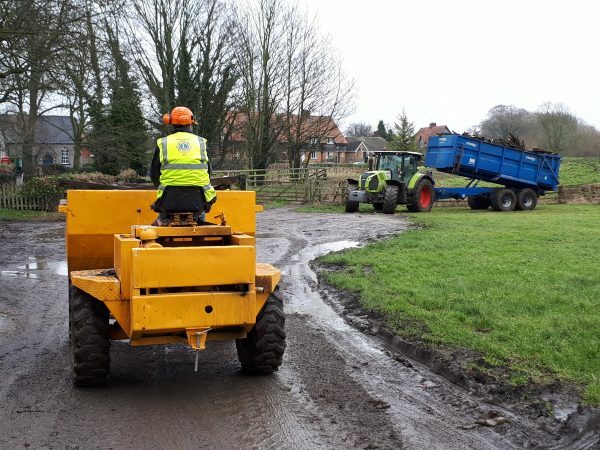 The dumper waits to empty its first bucket load of sodden wood once the trailer has tipped. This location is accessible for skip trucks to dispose of the waste. 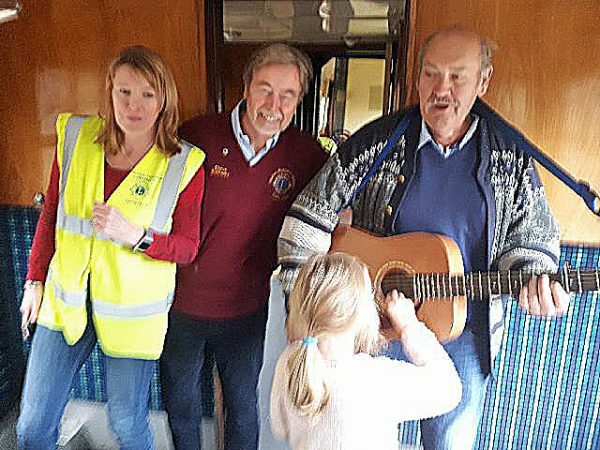 The Malton & Norton Lions Club have done what many others (amateur and professional alike) could not or would not do in the terrible conditions by the river. But no amount of trying to talk them out of this seemingly crazy plan would put them off, and true to their excellent reputation, they succeeded after 5 hours, still with smiles on their faces. 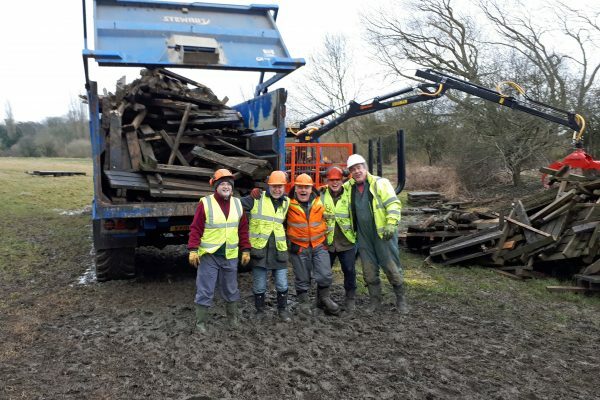 They moved six 20 cubic yard trailers of rubbish across boggy terrain! So boggy even a trusty old Land Rover Defender got stuck!! 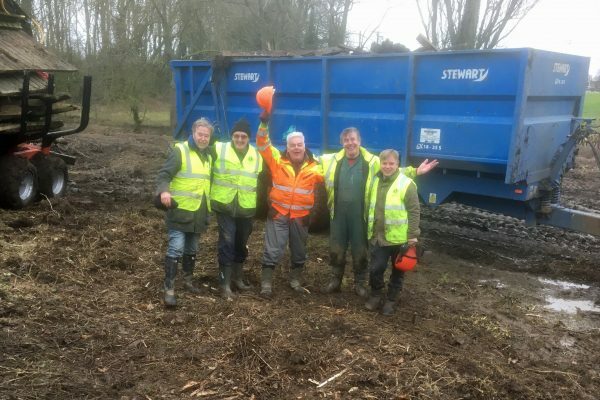 The volunteers running the Lady Spring Wood Project, Malton & Norton Area Partnership and many, many more owe these men an enormous debt of gratitude. The wood itself is bursting with wildlife and ancient, beautiful springs bubbling with clear spring water. Access to the woods and other local paths has provided joy for walkers for many years in this beautiful part of North Yorkshire. Lion Russ looks on as Jack ceremoniously slings the very last piece of wood into the trailer. 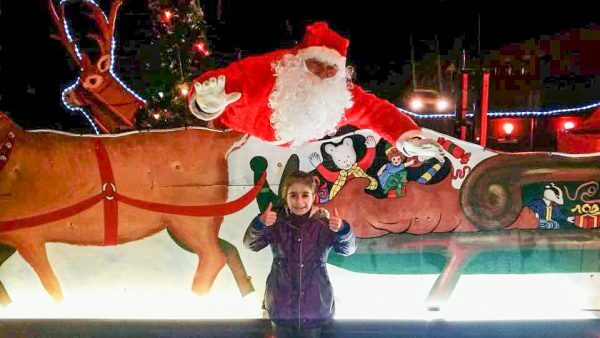 Through Just Giving a crowd funding appeal went out – take a look by clicking here – to add to funds from local organisations. 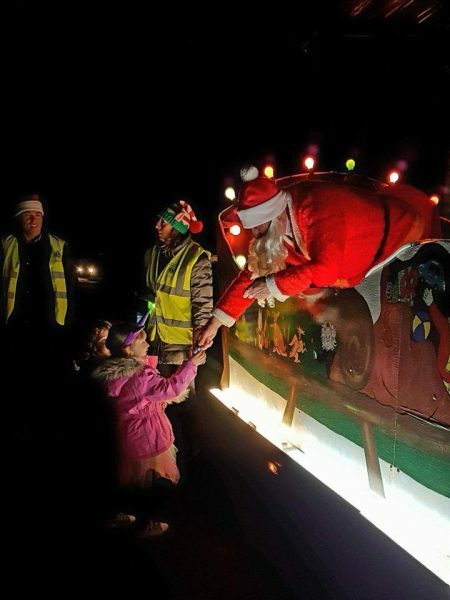 They needed to raise a further £6000 for a safe, accessible woodland pathway and bridge. 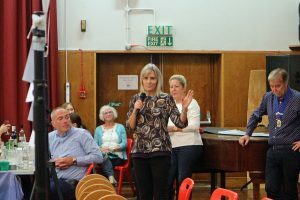 Feedback from their recent Questionnaire revealed that 24% would no longer use the area if the boardwalk is totally removed and 98% supported installing the new bridge. 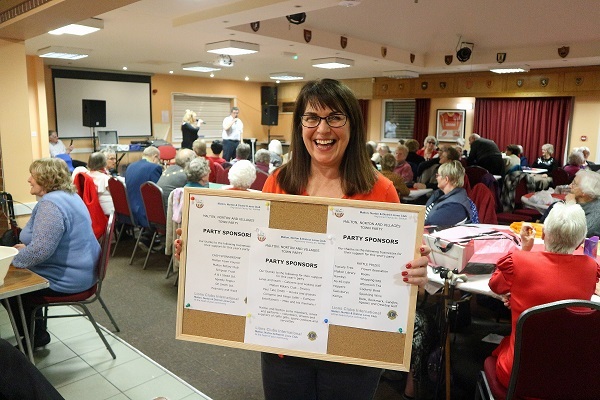 The plan is to use this money to fund the replacement of the bridge across The Cut south of Malton and Norton Rugby Club, and to contribute to the management of the Lady Spring Wood boardwalks which will be removed and replaced – with boardwalk and some ground level pathways – during 2018. 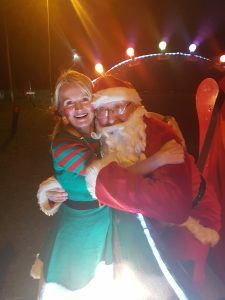 Santa really is all things to all people – it doesn’t matter how old or young you are, a visit from Santa creates a warm glow for most of us. 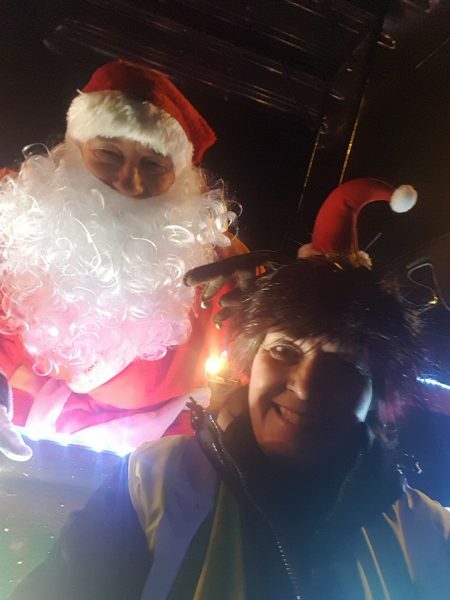 This year despite poor weather and the biting cold, Santa’s Sleigh has raised an incredible £15,842.84p for Lions Charities. 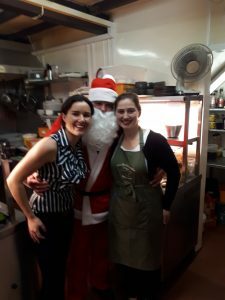 That money will help us over the coming months provide support for those less fortunate than ourselves and allow us to generally help make our local communities better places for everyone. 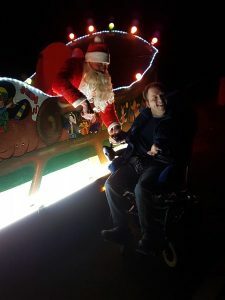 And if you’ve not been very well Santa can bring a much needed smile to someone who hasn’t had much reason to smile for a while. 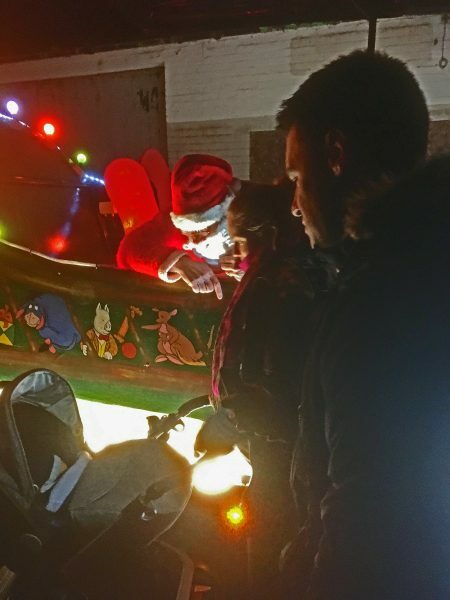 We think Santa’s youngest fan was Lion Russ Grimshaw’s new grandson who met him in Amotherby when he was less than a week old! But if you know better, please let us know! 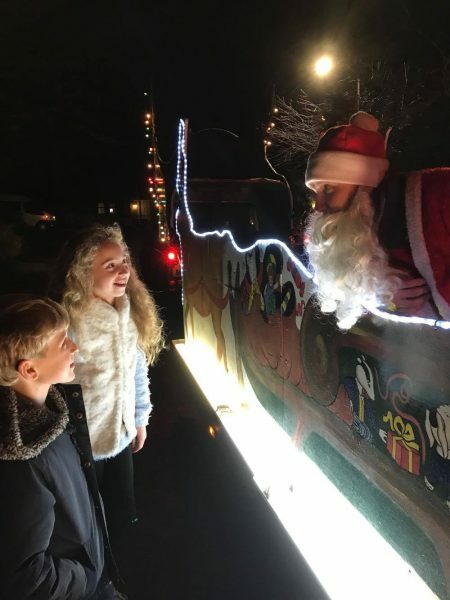 One of the lovely things about taking Santa around Malton, Norton and the surrounding villages is the huge variety of places he visits, from local inns to care homes. 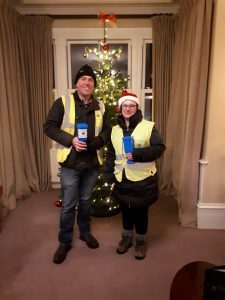 And as Lions we would be lost without all the friends of the Lions who volunteer night after night to help us collect. We couldn’t do it without you – thank you. 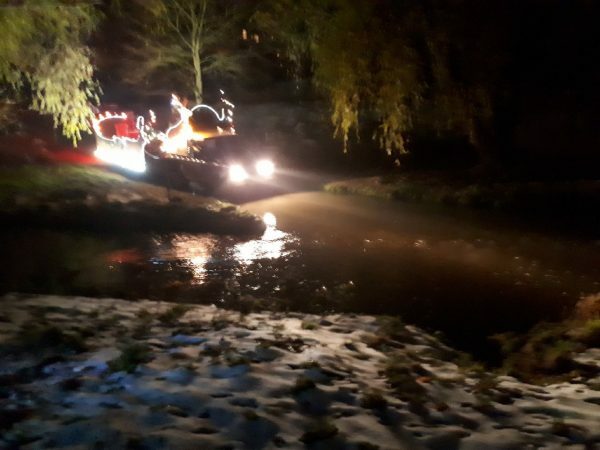 Perhaps the best place to photograph Santa’s Sleigh is as it crosses Settrington Beck. 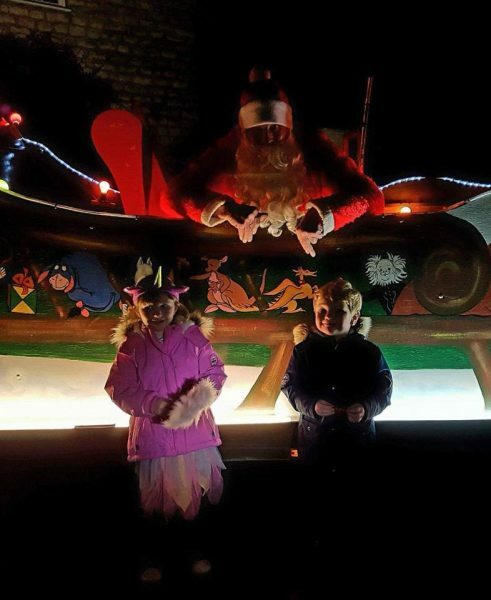 This year there was a covering of snow on the bank-side which added to the feeling that Christmas was arriving. 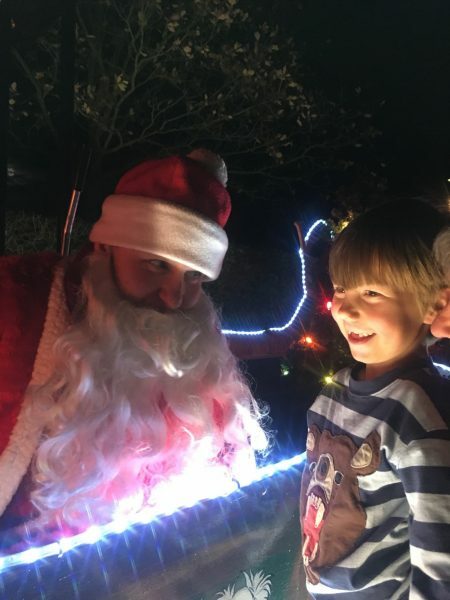 There’s a magic in the air when Santa’s around! 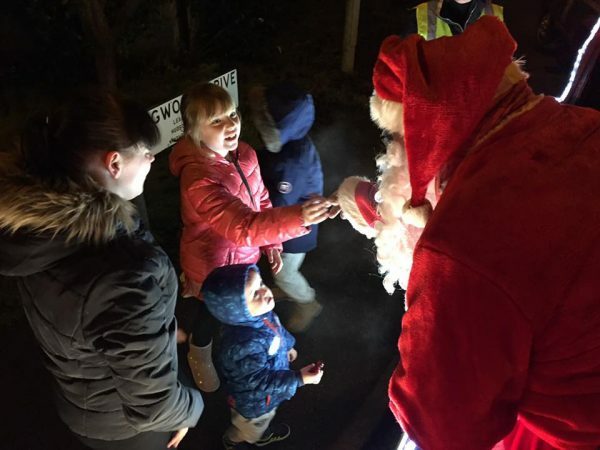 So a very big thank you from all the Lions to everyone who was so kind and generous as Santa came to visit. 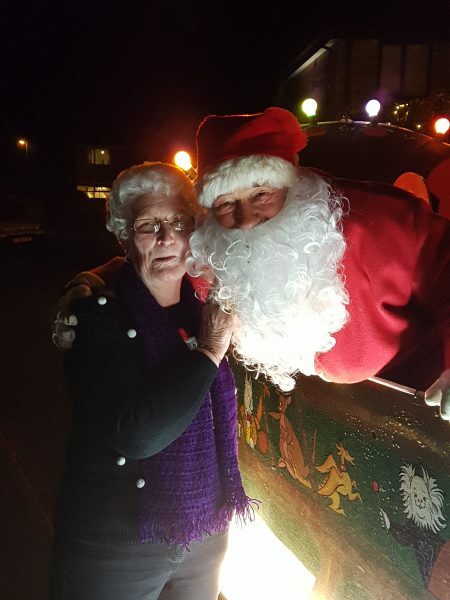 Every night we have up to 12 collectors (sometimes more), someone to drive the sleigh, a steward to help the sleigh driver stay safe, a collector steward to ensure we knock on as many doors as possible and a minibus driver when we visit the villages – not to mention Santa himself! 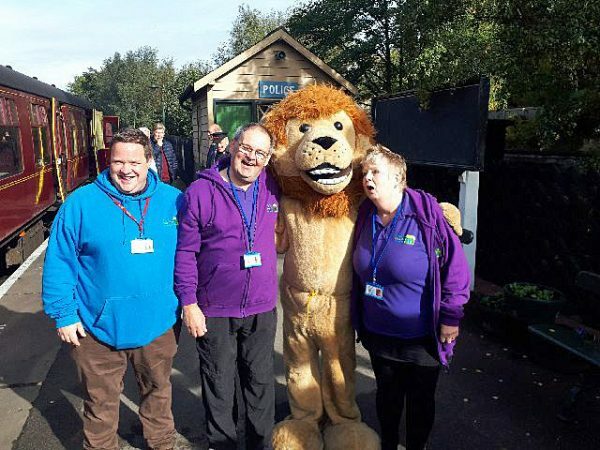 It takes a lot of arranging but for the Lions and their friends, we wouldn’t have it any other way! 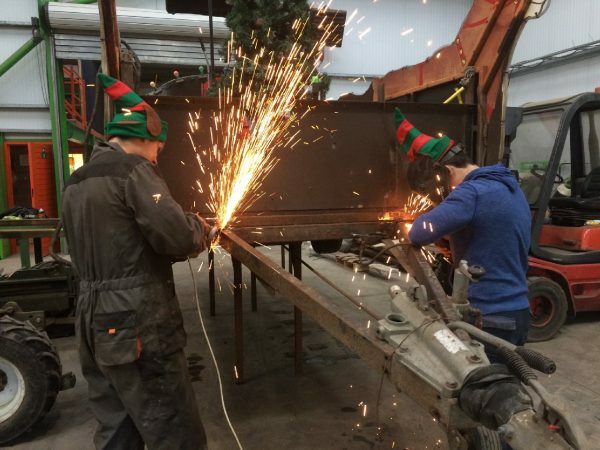 ..and thanks to Santa’s Ryetec Elves who help out when we break things! 100 years ago in 1917 a Chicago businessman called Melvin Jones looked at the deprivation in his city and decided to enlist the help of the business community to begin to address some of the issues – the Lions were born. During World War 2, Canadian Lions through their servicemen based with the allies in Britain provided invaluable support to children orphaned in the London Blitz – a gesture noticed by Queen Elizabeth our Queen’s Mother. To thank them, the then Queen sent her equerry Colonel Edward Wyndham (later Lord Leconfield) to Canada. 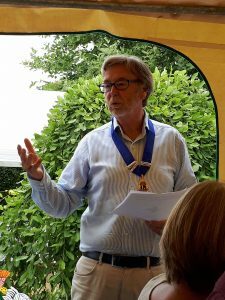 He was so impressed that Windsor (Ontario) Lions Club agreed to sponsor the first London club, with Lord Leconfield as its founding Charter President. 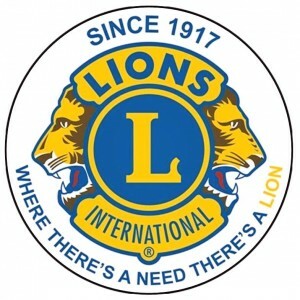 The first Lions Club in England (London) was formed on 1st March 1950. 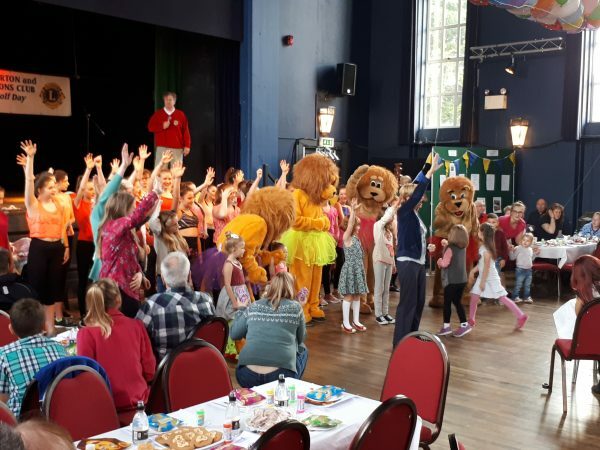 In 1963 Driffield Lions Club sponsored the formation of Malton, Norton and District Lions and 54 years later we celebrated Lions Clubs International’s 100th birthday with a full day of fun starting with a lunch party for Ryedale Carers, Ryedale Special Families and local young people. 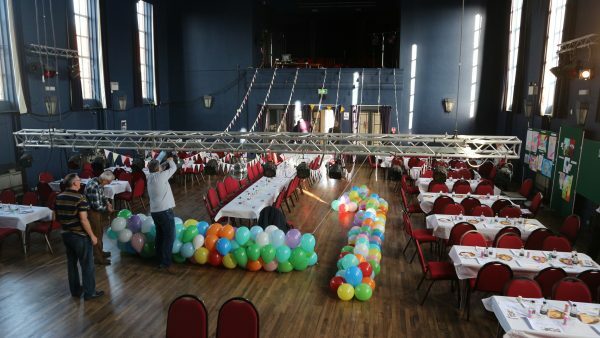 In total we had over 170 guests to entertain. 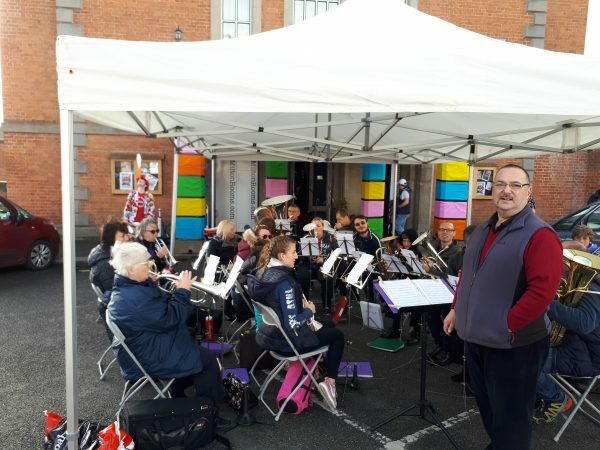 On arrival as well as a pride of four lions waiting to say hello to everyone, the Swinton Training Band serenaded folk and a juggler was on hand to demonstrate his skills. 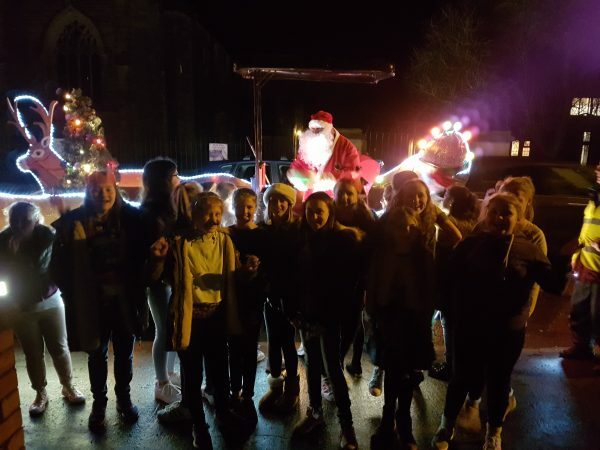 The talented dancers from Kirkham Henry entertained and got everyone on to the dance floor. 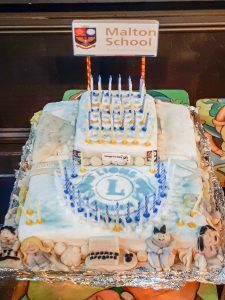 There was a seven foot high chocolate fountain with a gallon of Belgian chocolate flowing through it as well as plenty of sandwiches, jelly and ice cream provided by the Lions and their partners. 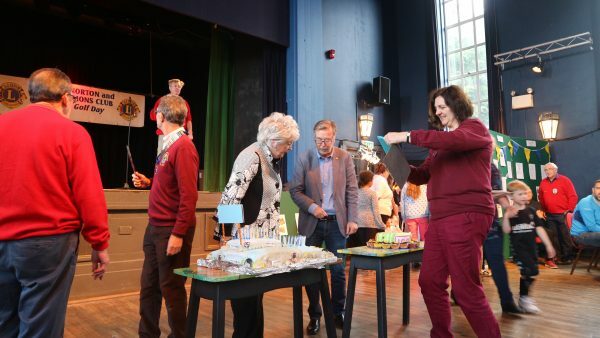 Malton School and Norton College had each baked a celebration birthday cake which were judged by Sue Martin the mother of celebrity chef James Martin. 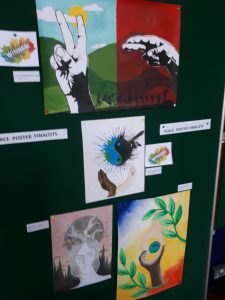 The schools had also produced posters for the Lions Peace Poster competition which were scrutinised by acclaimed Thixendale based wildlife artist Robert Fuller. By a whisker Malton School’s cake was judged best by Sue but both schools won prizes including signed copies of James Martin’s latest book. 12 year old Eliza Zephyrantke Leach was on hand to receive her prize of a book token for winning the younger age group in the Peace Poster Competition and Robert Fuller generously donated a signed limited edition print to be raffled at the evening’s Centennial Celebration Party. In the evening The Milton Room which played host to both events was transformed for an amazing party attended by almost 170 Lions and their friends with a wonderful Indian Buffet prepared by “India The Restaurant” from Yorkersgate in Malton, all sorts of fruit, marshmallow and doughnuts to be skewered and drenched in the chocolate fountain followed by the raffle and dancing to the small hours to the music of “HUGE“. 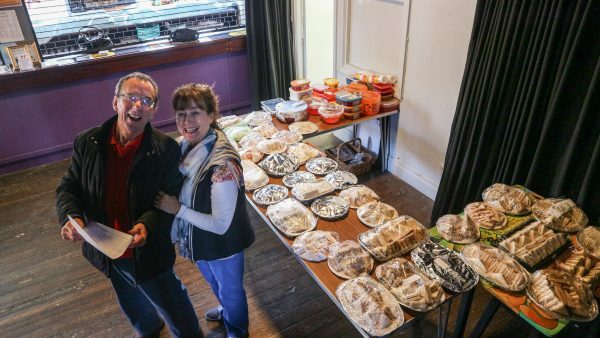 Lion John Hazelwood and Marian, daytime caterers-in-chief! Congratulations to Lion Nick Simpson and his team for the tremendous amount of work that went into arranging both events and getting the logistics spot on throughout. 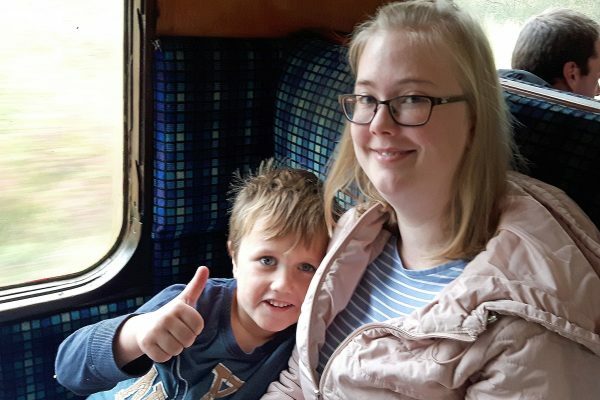 It seems everyone had a fantastic time. We did Melvin Jones proud! 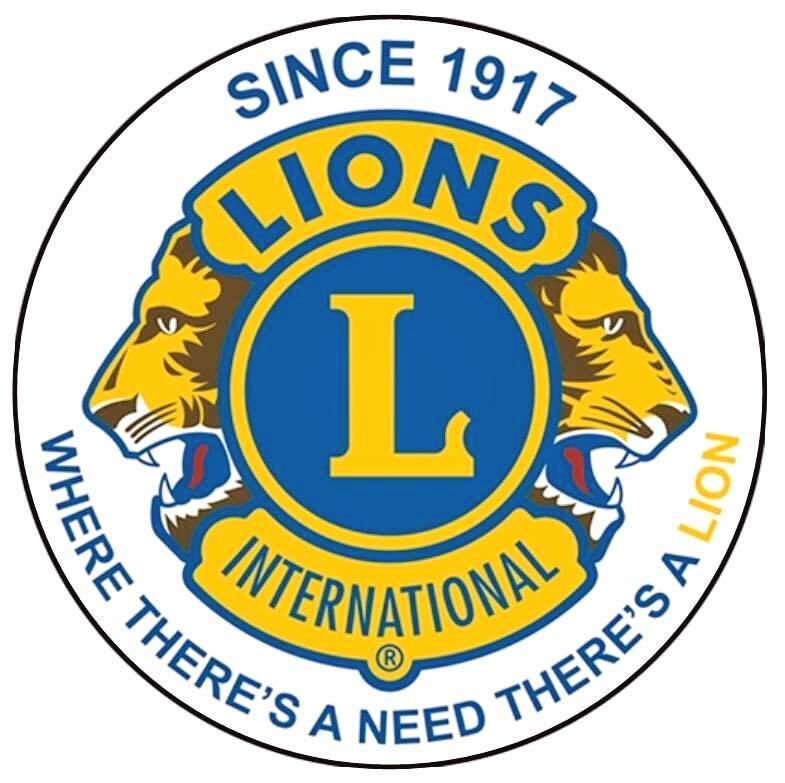 Lions Clubs International is the largest service club organisation in the world. 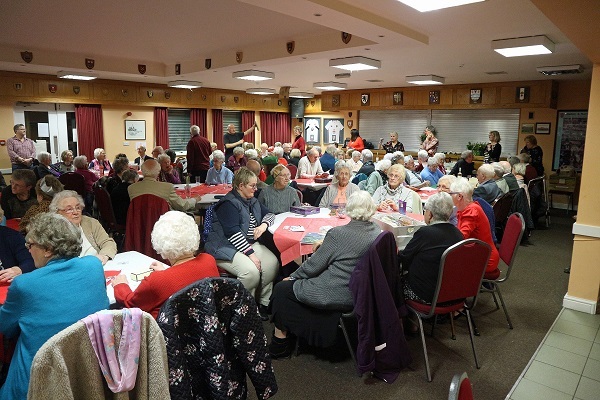 It has 1.4 million members in more than 46,000 clubs are serves communities in more than 200 countries and geographical areas around the globe. Since 1917, Lions clubs have aided the blind and visually impaired, championed youth initiatives and strengthened local communities through hands-on service and humanitarian projects. 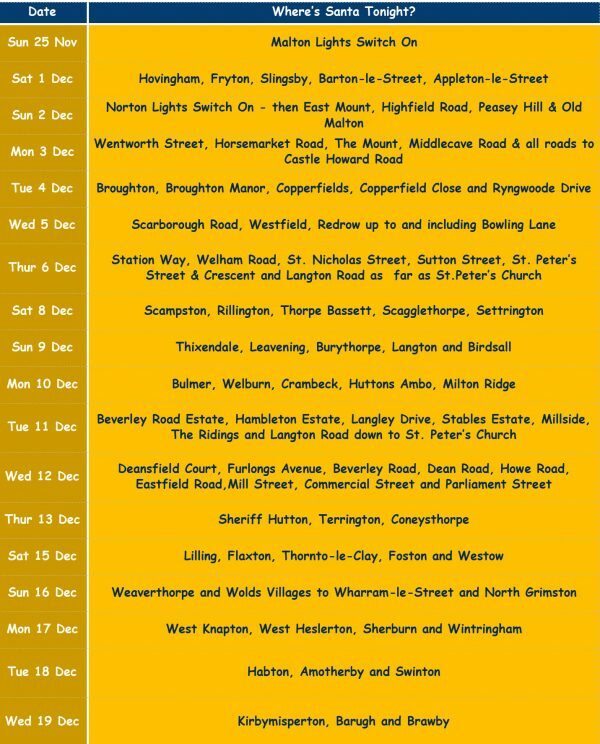 Come along on 21st October to The Milton Rooms to find out more about what we do in Malton, Norton & District. 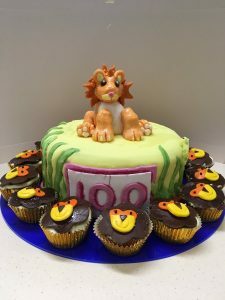 Lions around the world have been changing lives for 100 years through humanitarian service. Our Centennial Celebration is a time to mark this milestone, celebrate our legacy and look forward to the next century of service. Worldwide we’ll be marking the Centennial Celebration through to June 2018 but 21st October is your time to find out all about this incredible organisation on your doorstep. 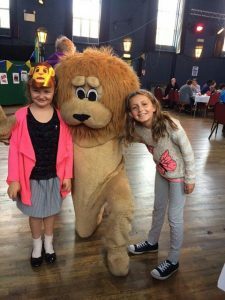 Malton Lion Wins Camel Race! Malton, Norton & District Lions Club are well known for their support of The Festival of Racing which showcases the racing industry in the two towns, but on 17th August Lion Brian Abbott stretched the link to racing to its limits when he took part in a Camel Race at the famous Beverley Race Course to raise money for Save the Children – and WON! 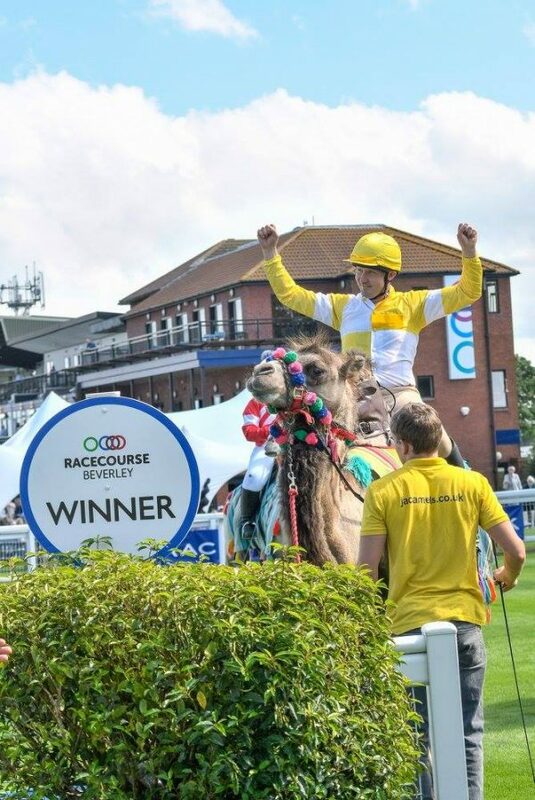 Hot on the heels of the previous Wednesday’s glamorous Ladies’ Day, the hilarious Reckitt Benckiser Save the Children Charity Camel Derby was the curtain-raiser to Thursday afternoon’s horse racing. 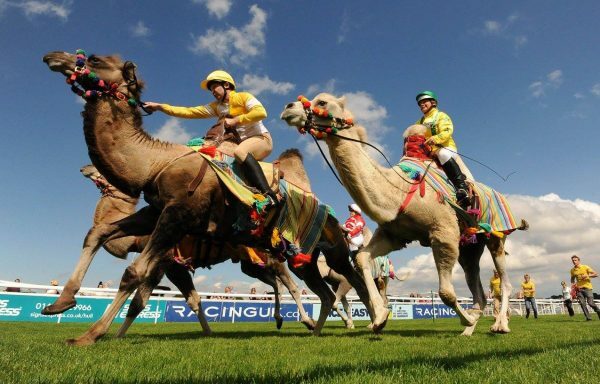 Eight intrepid volunteers including Lion Brian, an Equine Vet, lined up to race camels in two heats and a final at the Westwood track. 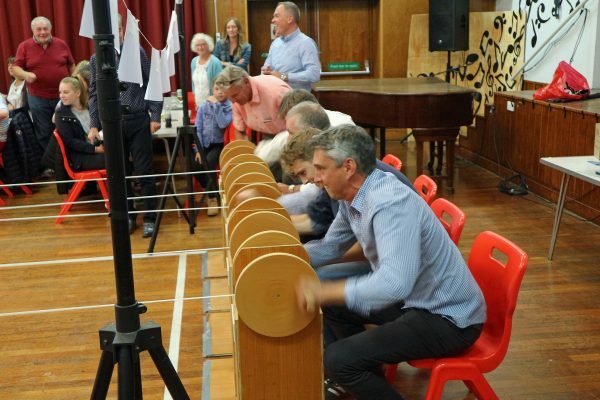 The race was over a furlong for a bucket of feed at the finish. Lion Brian’s steed made a steady start but enthused by the sight of the feed at the finish line came from behind under Lion Brian’s tutored eye and vast racing experience to take it by a length. 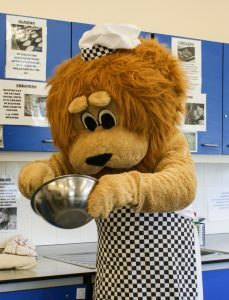 And in winning Lion Brian also raised over £3,000 for Save The Children. The history of thoroughbred Horse Racing in Norton, Malton and the surrounding area dates back to the 1600s. Langton Wold Racecourse meetings are recorded from before 1692 and by the time of its loss to enclosure and the plough in 1862, Langton Wold had come to be regarded as one of the finest courses in England. Trainer John Scott dominated the sport between 1832 and 1862 winning nearly ever classic! His stables were at Whitewall. When William L’Annson’s Blink Bonnie won the Epsom Derby in 1857 “Malton Church bells rang… and the pubs stayed open all night”. 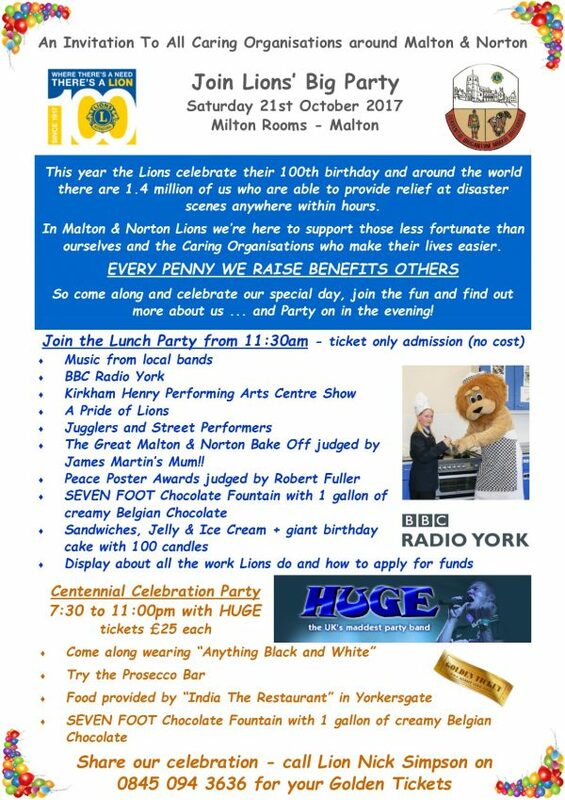 Malton Lions will be out in force for this year’s Festival of Racing on 17th September – please come along, say hello to the Lions and have a great day out. Click here for more information and to find out how to win tickets.